You know you’ve done this. Work day done. Finished your swim at the community pool, and headed out to your bike just as the dark is closing in on you. You swing a leg over, and reach down to switch on your lights. But, hey, they’re not there! OK, maybe I’ve done this. And maybe for one of two reasons: 1. I left my lights in my work bag, which I left safely at work. 2. Some rotten thief decided that my lights would look better on his bike. 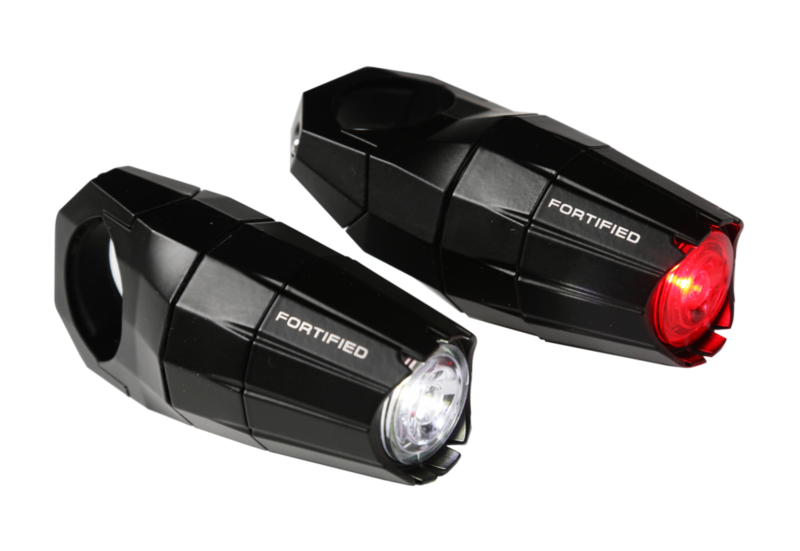 Well, there’s an answer for both scenarios, and–with lights being mandatory for night riding (and a great idea for day riding too)–Fortified is shouting it at us. Their new Aviator and Afterburner models are not just bright enough to keep you safe, they’re also really, really, really hard to steal. Warranty: Yep, lifetime warranty against theft, breakage, and water damage. So, they’re serious when they say it won’t get stolen. Upsides: Of course, the obvious. You don’t have to worry about removing and carrying these lights with you when you lock up your bike somewhere. Easy charging and relatively long battery life matched with several flash settings, and super easy to turn off. Also, these are made of some seriously strong material that take a decent beating. Downsides: It’s being a little picky for commuter lights, but since they are meant to be theft-proof, they’re not easily repositioned on your bike. It’s kind of a set it and forget it thing–shouldn’t be a problem for most except we finicky road snobs. At first look, these lights might not strike you as obviously unique. But from their super secret styled star-bolts to their even stealthier charging operation, they soon start to appeal to that part of you that really always just wanted to be a 007. 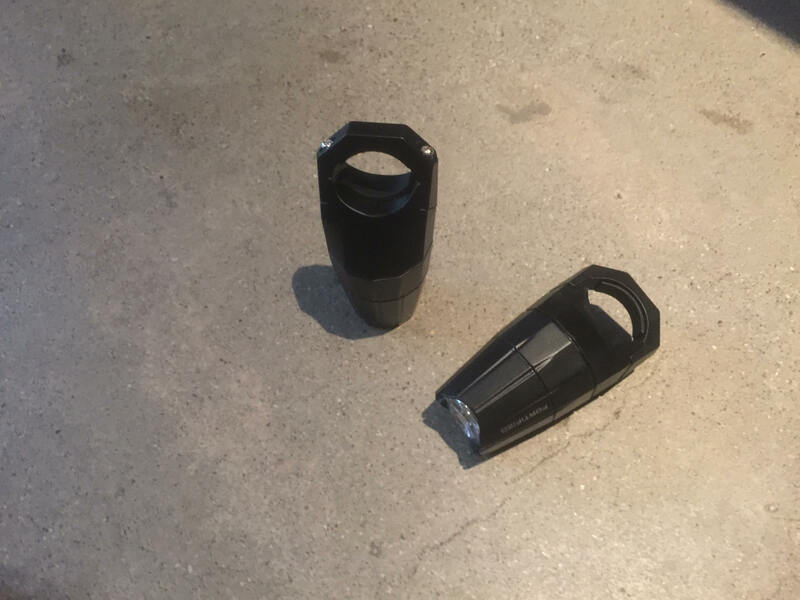 We tested the Aviator and Afterburner (that’s the front and rear light, which we received from the kind folks at Fortified in a dual pack) in their standard lumen iteration: 150 lumens in the front, and 30 in the rear. It is also available in a boosted version ($139), which doubles the output of both lights. In all honesty, I’d really recommend going with the boosted version. Double the lumens makes for better day-time visibility (especially with the taillight) when you’re riding on a busy road. 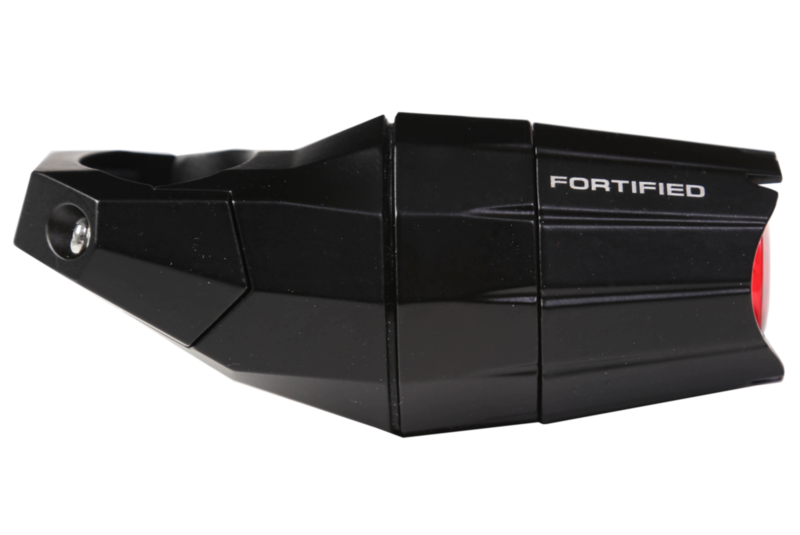 Fortified’s design creates a single integrated system of light and bike. For all purposes, the two are molded together. While there is a tool-free mechanism to remove the battery for charging, the light itself stays with your bike at all times. If someone were clever enough to figure out how to remove the battery, which is well disguised but not invisible, the most lousy thieves are able to make off with is the battery. If this happens to you, you can grab a replacement battery for just $15. In fact, if you’re really concerned about someone stealing the batteries, you could always remove them and carry them with you to put back in before you ride. Removal and installation takes a few seconds, and they are smaller than a tube of chapstick. But, I suppose that does defeat some of the purpose of having the Fortified lights in the first place. In my opinion, a thief will likely give up trying to take your lights before they ever figure out how to steal the batteries. I’m not going to lie. These torches are rather impressive. If you’ve had lights stolen before, you might have hit the alternative: Buy super cheap ones that you don’t mind losing. Since many of those alternatives are really low on the lumen count, it’s not really a great option–especially if you want day-time worthy brightness. That’s why Fortified’s system shines (I couldn’t help that pun, folks. I’m sorry). Each light has multiple settings with two flashing options, and steady modes. The rear has a setting which alternates steady and blinking that acts as a real attention-grabber. Perfect for the rider who always wants a taillight (which I never ride without, no matter what the ride–it’s just a great idea). An easy tap on the lens turns it on. Another tap switches modes. Hold it down for a few seconds it turns off. Side cutouts help with visibility at various angles, and these are bright enough that you won’t forget to turn them off when your ride’s done. Although we’re in a crazy drought here in California, I actually did get to test these on a rainy day. They held up perfectly well to the water, and I didn’t notice any seeping into the battery compartment. This makes them a great commuter light–don’t ever worry about removing them because they hold up to the weather. I also tested the shock-proofness as listed on the packaging by dropping them down onto concrete (OK, maybe I threw them down hard). A small scuff on the side, but no damage. They didn’t even open to reveal the battery compartment. Perhaps what sets Fortified’s lights apart from the pack is their “forever promise.” They stand by the theft-proof nature of their lights. While some weenies might find issue with the weight, the overall design is simple, sleek and rugged, which I like. The recessed push-lens operation for cycling through light modes is a nice choice to keep the lines clean and remove points for tampering. The Aviator and Afterburner both have good lumen output and visibility, not the best out there but given their size and price tag they are still very bright, especially if you opt for the boosted models. Overall, I highly recommend these torches. They definitely didn’t disappoint. Want to grab your own set? Head over to Fortified’s site to order. 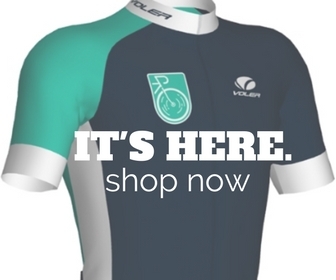 In fact, I hear they have a new seat post clamp that secures your saddle. 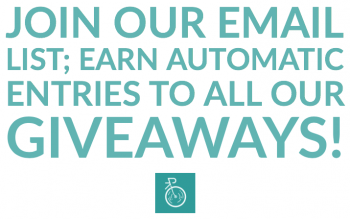 If you try it, be sure to let us know what you think!